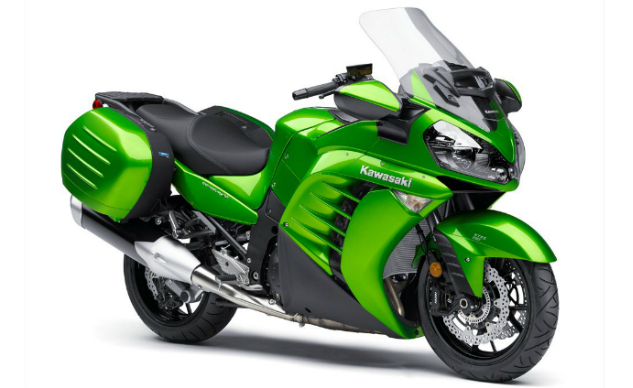 The 2015 Kawasaki Concours14 ABS boasts a litany of improvements including a new electrically adjustable windshield, revised linked braking settings, a revised first gear ratio, lighter steering at low speed, stiffer rear suspension and a new rear luggage rack. In our 2014 Heavyweight Sport-Touring Shootout from just a few months we jokingly labeled the Concours the “most not improved” bike of the quartet of models tested. That’s certainly changed now (which means another sport-touring shootout), specifically with the news Kawasaki has changed the linked braking – something we’ve complained about on numerous occasions. According to Kawasaki the Second Generation K-ACT ABS features two braking modes. The linked effect from front brake lever actuation is largely the same in both modes, but the linked effect when actuating the rear brake pedal is quite different. In Standard Mode, the linked effect is reduced at initial pedal stroke for a natural sensation when sport riding. In High Combined Mode, there’s a more pronounced linked effect from the beginning of the pedal stroke. The Concours is also endowed with new brake master cylinders. The vent is three-position adjustable and helps reduce the low-pressure zone in the cockpit and minimize buffeting. 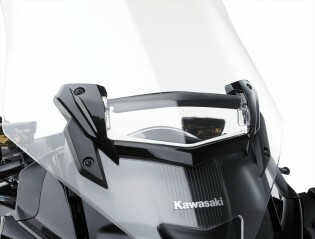 Another highlight of the new concours is the new electrically adjustable windscreen with a throw of 4.8 inches. In conjunction with the three-position vent the Concours is better suited for long-distance travel. Rider comfort also includes a new seat that’s sculpted to be narrower at the front for the rider and flatter and longer for the passenger. An exhaust pipe guard attached to the upper part of the exhaust mid-pipe helps protect the rider from heat when stopped. The Concours also boasts new TPMS sensors to warn of tire deflation, a tank pad to protect the paintwork from clothing scratches, and new cushioned passenger footpegs. The adjustable rear suspension was stiffened on the initial preload setting for better control when carrying a passenger and full luggage. The rear suspension also has a remote preload adjuster that allows the rider to tune the handling to their individual preference. To help ease low-speed manuevers Kawasaki revised the bike’s first gear ratio and replaced the old steering stem seal with a new, low-friction one. Last, but not least, Kawasaki dressed up the Concours with silver bezels on the instrumentation.